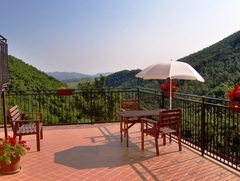 In central Italy, in the beautifull hills of Le Marche is situated Agriturismo Carincone, a restored farmhouse from 1670 with 5 charming holiday apartments. All apartments have a private terrace, a fully equipped kitchen, a cosy livingroom, a bedroom with a double bed and a modern bathroom with a toilet, bidet, sink and a walk-in-shower. Outside is a swimmingpool and a large garden with sunloungers. Bedlinen and bathtowels are included. We would be glad to welcome you in one of our cosy apartments for a relaxing holiday. Please contact us for more information.